Passion, persistence and power are integral to two things I’ve done: authored three books and lost 260 pounds. However, purpose is what makes it all worth it. The word passion means many things to many people. What I’m talking about, though, is an intense desire or enthusiasm, a compelling feeling that drives me forward. Passion for writing a book usually comes in the form of wanting to actually complete the challenge, feeling a strong desire to be an author, having a story that is burning a hole in your heart and just has to come out, believing a message must be shared with the universe. Passion for weight loss tends to fall into several categories. These include the desire to look good, to feel better, to get to a specific weight goal for a job or event, to get rid of a disease, to be present in the lives of children and grandchildren. Passion is a quick desire that lights up your life. Passion is a necessary spark to begin, but passion alone will not carry you through to the end. The definition of persistence is “firm or obstinate continuance in a course of action in spite of difficulty or opposition.” This is where the rubber meets the road. While having one’s name on the cover of a book or losing an extreme amount of weight sound like great ideas, when the hard work begins many stop. This is why I’ve got parts of many books written. As a writer, I’ve written articles, blog posts, stories and poems all of my life. Writing a book, though, is hard work. I like the term “obstinate continuance” because that’s what it really takes. It’s this decision that no matter what happens, I will get this done. Weight loss is even more difficult. I wrote my first book in two months, and then four months later it was published. It took me 10 years to lose 260 pounds. Of course, the amount of weight someone has to lose will determine the time frame, but in most cases it will be more than two months. It is this determined commitment, though, that keeps both the author and the one who wants to lose weight on the journey. Add in the fact that you’ve probably told everyone you know that you’re writing a book or losing weight and the pressure is on to perform. Although passion and persistence are necessary, without power is hard to continue. For me, the power to start, continue and stay on both of these journeys comes from God. It is so easy to get distracted when writing a book. The problem is I’m usually adding that goal into the mix of an already overfull life. Something has to be pushed aside in order to make time to write. With my first book, that was television. I used to watch it two or three hours in the evening. Now, I rarely watch and then it’s something I’ve recorded so I can zoom through it quicker. In reality, though, the only time I can write a book is when I know God has called me to that purpose. When He has, He will multiply the time I spend. It’s a truth I’ve experienced over and over again. I sit down to write and the amount of work I can get done when hyper-focused amazes me. I feel the power of God urging me forward. The power for weight loss is really the power of God to transform or change us. It is not so much willpower, but a change of mind, which is even more monumental. It’s a task only God can perform. My weight loss journey came first. After that, God showed me I had something to write about. Both, though, had the same purpose, which was to reveal how God can help an ordinary woman to lose an extreme amount of weight. He had to take me through the rough, difficult day-in, day-out journey of losing that much weight. In that place, I learned to depend on Him completely, which is His ultimate purpose for each of us. I knew I could not lose weight on my own. I’d tried and failed too many times. I had to follow His directions. I figured writing a book was different, though I’d tried to do that many times, too. However, God made me a writer so surely I didn’t need His help to write a book. What I found out quickly, after slogging through months of misery, was I needed His direction more than ever in telling the story of how He led me each step of the way. Purpose always comes first in anything we decide to spend time on. God’s purpose is always to draw us closer to Him. Whatever you are going through today, God can use it to bring you closer to Him. And that will make it worth every ounce of pain and difficulty. It’s in those hard seasons that character is built and God’s design for our lives honed to perfection. If it’s time for you to write your book, this is the last call. 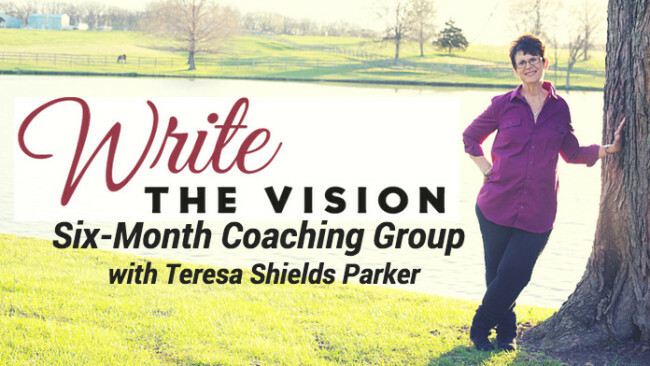 Write the Vision Coaching Group is open through Aug. 31. In this six-month group, Teresa Shields Parker coaches potential authors through the process of writing their book, with the goal of having a book or manuscript in their hands at the end of the course. Once the deadline passes the group will close while regular people like you become authors. Join us. Go HERE for all the information and to sign up.